Chinese black beans are naturally gluten free and their unique taste make them a special ingredient that is always in my pantry for many Asian dishes I make. However, they do go by many different names so a bit of an explanation may be helpful. First off, Chinese black beans are not the black beans, sometimes called black turtle beans, that you may be familiar with using in Latin American, Mexican and Southwestern dishes. These black beans, whether canned or dried and then cooked, are used in soups and salads, dips and salsas, rice dishes, chile and any kind of wrap from burritos to quesadillas. I use them but not in Asian cooking. This post is not about this type of black beans. Chinese black beans go by many different names and their complex, pungent flavour is unmistakable. They are dried, black soybeans and the ones I buy are the Yang Jiang brand (in the yellow box) as shown in the photo. They use salt in the process of fermentation as a way to preserve them; so technically all of those names make sense. If you simply want to cook with them you just need to go look for this brand. It has never changed in the thirty years I’ve been using them and I can always find these at my Asian grocery store. Now, you can also buy them on Amazon. These preserved beans can be stored in your pantry. If you look at the photo you will see how I cleverly attached the recipe for the black bean sauce to the jar with the beans in it. I only make this recipe once or twice a year so when I do I want the recipe right there. Is Chinese Black Bean Sauce Gluten Free? No, none of it! At least that is my experience as all bottled black bean sauces list soy sauce and wheat on the label. I’m sure you can find a gluten free brand somewhere but I just quit looking and made my own. It takes less than ten minutes and it works for me. I have a separate post with my recipe for Chinese Black Bean Sauce. What you need to know to get started is that both the Chinese black beans and the black bean sauce can be used in many Asian recipes. 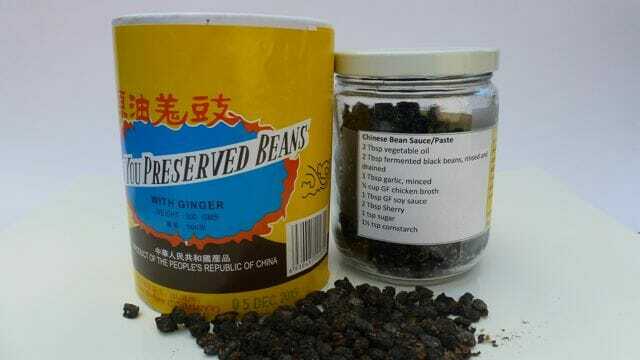 Use it when you see bean sauce, black bean sauce, ground bean sauce or Chinese bean sauce in any recipe. If a recipe calls for these exact names but includes with garlic or with ginger in the name, simply use the sauce and adjust the garlic or ginger to your liking. In the comments below I’d love to hear where you found these black beans or what you used them for. Hi Anna. No, you do not have to cook these beans. In my recipe for Hoisin Glazed Pork Ribs I just chop them up and put them in the sauce. They are then cooked but I think you will be fine to just put them in your sauce. Good luck! Heya, I’m trying to come up with a quick and easy gluten free version of plum/ Peking/ hoisin sauce. Do you know if you have to heat / cook these for them to be suitable to eat or could I just blend them with plums to get a satisfactory base for a sauce? What is the brand name on the yellow box? It isn’t visible in he photo and I want to make sure I get the same ones. I like the bean sauce recipe. However, I could be wrong but I thought these salted black soybeans were initially fermented with a bit of wheat flour, and then preserved with salt. So I wasn’t sure whether they were free of gluten.